Optimal Opti-Nitric is the most advanced formula combining the amino acids L-arginine, ornithine and citrulline together to boost nitric oxide levels within the body. 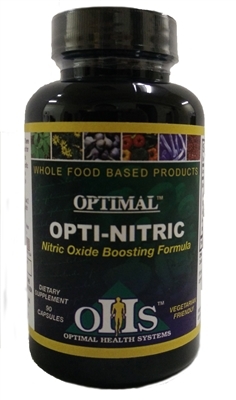 Optimal Opti-Nitric uses these amino acids to help with platelet reactivity and improving endothelial function. This is important to keep arteries and other blood vessels flexible and active. Nitric oxide is what the body uses to stimulate your blood vessels to expand and contract keeping blood pressure in check. L-citrulline is one of the three dietary amino acids in the urea cycle, alongside L-arginine and L-ornithine. Individuals, both men and women, with poor circulation, high blood pressure, high cholesterol and many common health problems are often deficient in the critical molecule nitric oxide. With enough L-arginine, L-ornithine and L-citrulline, according to the research, you can reverse the deficiency and dramatically improve your cardiovascular and overall health.